Standard key signatures are available in the Key Signatures palette in the Basic or Advanced workspaces. 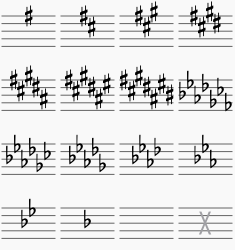 It is also possible to create custom key signatures (below). Drag a key signature from the palette onto an empty part of a measure. Select a measure and double-click a key signature in the palette. Select a note and double-click a key signature in a palette. Press Ctrl (Mac: ⌘) and hold while you drag a key signature from a palette onto a measure. Drag a key signature from the palette onto the key signature to be replaced (or onto the measure containing the key signature). Select the key signature to be replaced, and double-click a new key signature in a palette. Press Ctrl (Mac: ⌘) and hold while you drag a key signature from a palette onto the key signature to be replaced (or onto the measure containing the key signature). Click on an existing key signature and press Del. Drag the empty key signature from the palette (in the advanced workspace) onto the measure. Select one of the three options. If you are in a part and want the new option to apply to all parts, click on Apply to all parts. Select the relevant key signature and untick "Show courtesy" in the "Key Signature" section of the Inspector. From the menu, select Format → Style... → Page, and untick "Create courtesy key signatures." Note: Courtesy key signatures are not displayed at section breaks. Press Shift+K to display the Key signatures section of the Master palette. In the Create Key signature panel, drag accidentals from the palette onto the "staff" above to create the desired key signature. Use the Clear button, if required, to remove all accidentals from the "staff." Press Add to move the new key signature into the library (center panel). Note: Playback of custom key signatures is not currently supported. Drag and drop the key signature onto a palette. Select a measure and double-click a key signature in the Master palette. Drag a key signature from the Master palette onto a measure.